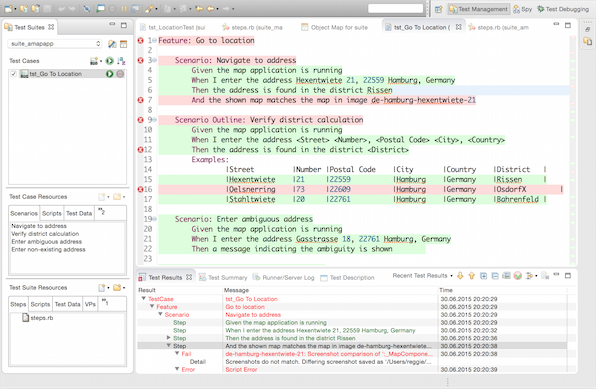 Tackle automated GUI testing for your Qt applications with Squish for Qt. Squish features dedicated support for GUI test automation of all Qt widgets, QML and Qt Quick controls as well as embedded Qt Webkit and Qt WebEngine content. Benefit from cross-platform and cross-device support, easy test case recording, powerful scripting, full BDD integration, remote- and multi-application testing, automation via CI and ALM systems and more. With Squish for Qt you can automate the tests of your application on any desktop, mobile and embedded system without the need to modify the application. This allows for the creation of functional regression tests and system tests for Qt Widgets, Qt Quick and QML applications and even to automate interactions with embedded web content (Qt Webkit or Qt WebEngine). Taking cross-platform support seriously, a test which has been created on one platform can be ran against the same Qt application on any other platform with no changes required. Automate the tests for your Qt applications on Windows, Linux, macOS, Unix, iOS, Android and several embedded systems such as embedded Linux, QNX and more. Tests are portable across all platforms. To automate tests with Squish for Qt, you do not need to change your application in any way. Nor does Squish require the source code of your application. All Squish requires is the binary of your application as you’d ship it to your customers. Squish comes with dedicated support for all standard (buttons, menus, etc.) and complex (lists, tables, trees, etc.) Qt widgets, QML and Qt Quick controls. It is also fully supported to automate custom controls derived from Qt widgets and controls. Squish for Qt integrates Squish for Web to allow testing embedded Web content in your Qt and QML and Qt Quick applications using Qt Webkit and Qt WebEngine. Squish for Qt exposes the complete properties (Q_PROPERTY) and functions (slots) of all Qt and QML controls, models and other objects as well as custom properties and functions to the test script languages and the Squish Spy. Squish for Qt, by integrating Squish for Windows, allows automating Qt application which embed native Windows controls. Squish for Qt allows to connect test script functions to Qt signals and Qt events allowing a test script to react on application signals and events. Squish for Qt supports the automation of standard gestures (touch, flick, etc.) as well as complex, multi-touch gestures. Click here to learn about more Squish features such as BDD (Behavior Driven Development) support, advanced verifications, distributed testing, extensive CI, ALM and Test Management integration options and more.